Having argued that Fantasia is encyclopedic in scope, I now want to slow things down (ala Lindsey Waters?) and consider one of its episodes, Dance of the Hours. In its original setting, Dance of the Hours was a ballet within an opera, Amilcare Ponchielli’s La Gioconda; that is to say, it was a play within a play. This music was a bit long in tooth by the late 30s and ripe for parody. 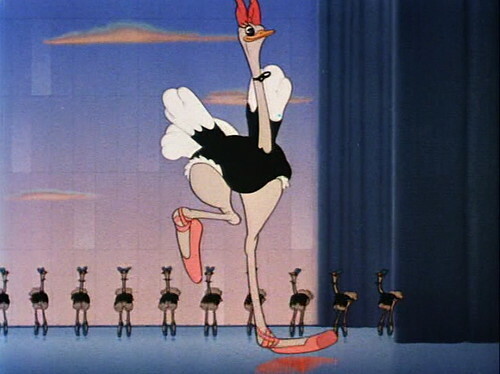 Disney’s basic conceit is to have ungainly animals dance the roles normally taken by graceful ballet dancers. Beyond this, as I have argued in an exchange with Michael Barrier (animation historian and Disney biographer), these animals have a hard time keeping in role. 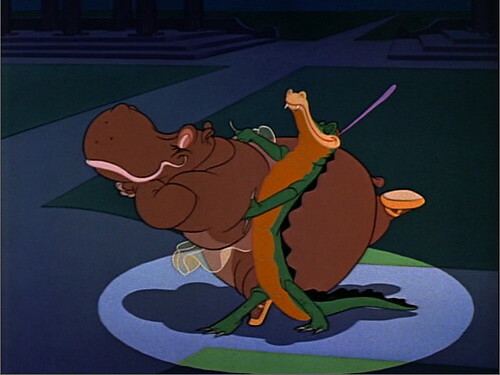 As much as I would like to continue exploring that tension, however, I want to look at something else, the imaginary setting which Disney provided for the ballet. In the course of examining details of the foreground action I realized the cues we are given about that setting cannot be assembled in a coherent account of what is happening. I’m not sure what, if any, conclusions can be drawn from that. The purpose of this post, then, is to raise the issue. It was somewhere in this sequence that, on one occasion, I said to myself: “They’re not acting! They’re for real!” For what it’s worth, that’s the observation that prompted me to think seriously about Dance of the Hours. This promenade gives way to several turns, which then give way to the finale, when everyone is back on stage in furious zigzagging motion. When Dance opens we see the doors to a large room, the doors open, and the camera zooms through (perhaps) a hallway to face a stage with lowered curtains in front. The curtains rise and we see an ostrich awakening and beginning to dance. Clearly we’re looking at something happening on a stage. But, as we will see shortly, we leave the stage near the end of this first segment and go out of doors, where the action remains into the finale. Two thirds of the way through the finale it suddenly becomes obvious that we are watching something take place on stage. As the music comes to an end, the camera zooms back so that we see the entire stage, with dancers arranged in a final tableau, and keeps zooming back until we are outside the hall, looking at the doors, which then fall off their hinges. So, this five-section drama begins on-stage and ends on-stage. In between it is out of doors, in the “real world.” Except that it is not - by which I do not mean that it is all a cartoon. That is obvious. What is not obvious is just how this cartoon works. Look back at the previous frame grab. This action is taking place outdoors. Ben and Hyacinth are on walkway with grass in front of them and behind them. But they also appear to have a spotlight shining directly down upon them, for their shadows are directly beneath them. Nowhere in this garden do we see lights up on poles, much less strung out over open spaces. But if we imagine this promenade to be taking place on stage, then the light is readily interpretable as standard stage lighting. Thus, on the simplest interpretation of the visual cues before us, this space is ambiguous, it is both outdoors and onstage. That ambiguity is what interests me. 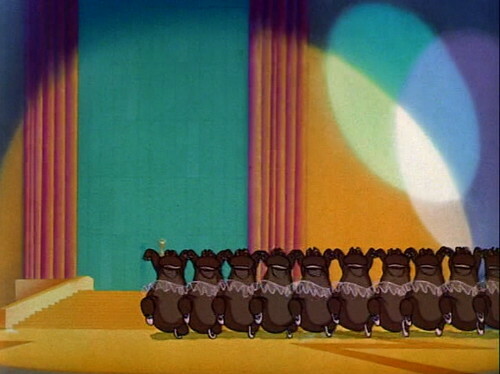 Even as the cartoon presents us with a line of foreground action where animal dancers have difficulty staying in role, it also presents us with a distinction between being onstage and being in reality. It then proceeds to elide that distinction. You can see light horizontal and vertical lines indicating seams in the surface on which the sky is painted. 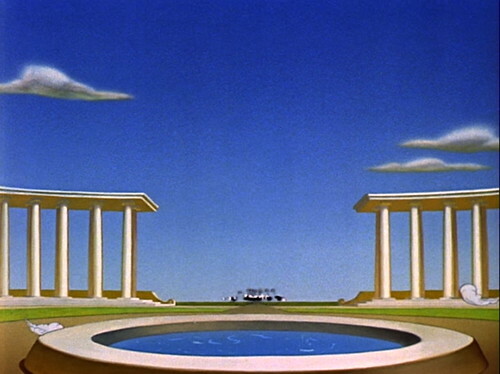 That motif is quite obvious in many fames in this segment and it will return at the very end. They run directly to the rear, getting smaller and smaller in the distance until they disappear. They couldn’t do that on a stage, as no stage is that deep. Notice as well that the sky appears to be perfectly smooth; there is no evidence that it is painted on some surface. One can only conclude that, within the terms offered by the cartoon, we are outdoors. It is not, however, a matter of arriving at a conclusion through some process of deductive reasoning; it is a matter of direct perception. 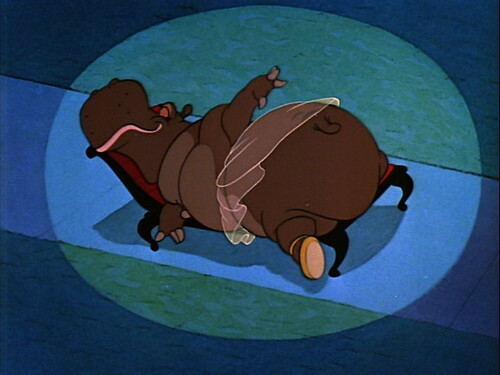 Once the ostriches are gone, the lead hippopotamus appears from within the pond in the person of Hyacinth Hippo. Hyacinth then dresses and goes through her toilette with the help of her ladies in waiting. Then they all prance around in the garden. Hyacinth becomes exhausted, she yawns, and her ladies drag her to a chaise longue, which simply appeared behind her. She goes to sleep and remains on the chaise as the elephants go through their dance in the next sequence. The elephant act is based on bubbles. They dip their trunks into the pond and then blow bubbles, lots of them, some of them quite large. That is not something that normally happens in ballet; we are moving away from the initial premise, animals dancing ballet. These animals are now dancing something else. Further, some of the elephants manage to sit on a bubble and float in the air. How did elephants become so light that they can float on a bubble? Just what kind of world is this? All of a sudden it has become much stranger than is was at the beginning. The sleeping Hyacinth is in mid-air supported on a column of bubbles. Notice that the elephants are on a low platform. That platform wasn’t there when Hyacinth first fell asleep on the chaise and it won’t be there when the next segment begins. Where did it come from and where will it go? And what is that curtain waving in from the right? That looks like something one would find on a stage, not in a garden. The alligators spot her, come down from on high by slithering down those fluted columns, surround her on four sides, and dance an elegant figure or two. Then their leader, Ben Ali Gator, appears on high, spots her, and leaps down. His companions vanish, he approaches, is smitten, and the two dance the romantic pas de deux that is the dramatic climax of the ballet. Throughout this segment there is a lot of lighting that reads naturally as stage lighting (such as the spotlight on Hyacinth), but we have not yet returned to the stage. Ostensibly, we are still out of doors. Thus the single most important event in this entire ballet, the passion of Ben and Hyacinth, takes place amid contradictory cues about “baseline” reality. Does that ambiguity have any impact on how one perceives their interaction? Though it lasts just over a minute, that interaction is complex and subtle, more than I can examine in this context. Suffice it to say that, when it is over, Hyacinth is miffed at Ben and she runs gleefully away; he follows just as gleefully. And everyone else joins in. Wherever the ostriches and elephants went when they disappeared into the distance, they’re now back, as are the hippos. The alligators are chasing them all - the ostriches, hippos, and elephants are all female, the alligators male - catching them, carrying them, and even riding them. Look at the rear wall; clearly we’re looking at overlapping spotlights. If you look closely at the turquoise area you’ll horizontal and vertical lines that look like seams. From here on to the end we’ve got abundant cues that we’re indoors and onstage. This last transition, from (ambiguously) outdoors back to the stage, is quite different from the first, from the stage to outdoors. In the first transition we followed a central action - running ostriches - through a hall and-or door and outside. The transition is quick, but not abrupt, and a single action connected the two spaces. By contrast, the return to the stage is very abrupt; it happens in between two frames and is not foreshadowed in any way. Nor did any flow of action connect the two scenes; they depict two different streams. In the music, however, the 8-bar phase immediately following the transition is a repeat of the 8-bar phrase immediately preceding it. By contrast, the original move outdoors occurs in the middle of a phrase, not between two phrases. The finale lasts roughly 109 seconds - the whole piece is about 13 minutes. The transition to stage mode happens about 37 seconds from the end of the piece. The action neither slows down nor picks up in the race to the end. It just keeps going, though it shifts abruptly in focus - ending with Ben juggling Hyacinth with his feet and hands - and comes to a well-negotiated, if not graceful, conclusion. That, more or less, is what happens, but what’s the point? I’m not sure. I don’t even know how much one notices, or how it is that one notices it. To the extent that I am able to recall my own responses, I think I noticed all the spatial and lighting cues that I’ve pointed out so far - and more. But it wasn’t until I became curious about the dramatic space that I was consciously aware of the inconsistencies, and figuring them out took a fair amount of work to accomplish. I watched the segment several times, stopping and starting, slowing it down, and making frame grabs. Is it none-the-less possible that I picked up the incongruities unconsciously the first time I saw Dance of the Hours? I do not know. Contemporary cognitive and perceptual psychology has shown that there is a great deal of unconscious processing “between” raw sensation and conscious experience. Perhaps that unconscious processing picks up the inconsistencies. But I don’t really know and rather suspect that is the wrong approach to the problem. While I don’t know what the right approach is, I’d like to conclude by thinking about gags, as this cartoon is a virtuoso exercise in advanced gagology. What is a gag? When Road Runner steps off a cliff but remains in the air until he looks down, that’s a gag. When Minnie Mouse cranks a goat’s tail so that “Turkey in the Straw” comes out its mouth, that’s a gag. When an elephant blows a bubble and a fish turns up in that bubble, that’s a gag. 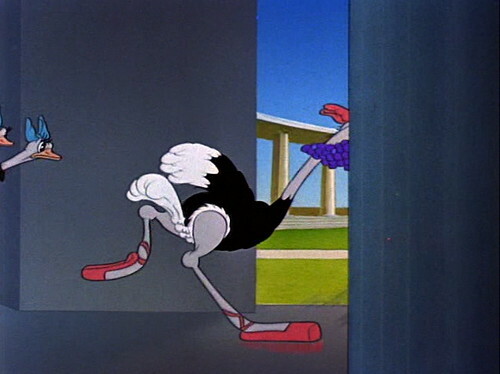 When Bugs Bunny is running toward home plate and distracts the catcher with a pin-up picture, that’s a gag. There must be thousands upon thousands of gags, though some get recycled time after time (e.g. walking off a cliff). A rather large class of cartoons depends on gags, though not all cartoons do. 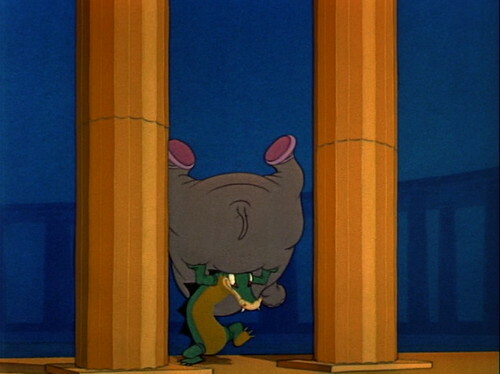 There are very few, if any, gags in the other episodes of Fantasia, for example. Gags are always working against something, a background of conventionalized expectation. Much of that expectation comes from living in the world, while some of it seems to be the property of a particular cartoon universe (e.g. Road Runner) and some of it even seems to develop within a particular cartoon. There is no easy way to characterize the “baseline” against which some cartoon event is perceived to be a gag. My contention is that the baseline for the focal action in Dance of the Hours is that these animals are playing roles, and hence there is something about them that may, at any time, escape the requirements of the role. Disney’s animators then develop gags from that premise. My impression is that these gags start slowly and then pick up in frequency; I also suspect that there is some ebb and flow in the gag rate, but have made no effort to verify these impressions. When we reach the elephant segment the animators introduce a number of gags that depend on those bubbles - such as the fish gag I mentioned above. These gags force the elephants out of their choreographed roles. This is quite different from the role slippage we’ve seen in the ostriches and the hippos. The ostriches gets hungry and so chased after the grapes; Hyacinth is vain and so bats her eyelashes and modestly tugs at her tutu. These are failings within these animals. A fish turning up in a bubble is not a failing within the elephant that blew the bubble, nor is a burst-bubble that dumps an elephant on the stage. These gags extend deeper into the fabric of this cartoon universe. When Disney’s artists have the elephants elevate Hyacinth on a pedestal of bubbles, they are connecting the role-based gags of the main narrative line to the ambiguities they’ve embedded in their treatment of place and circumstance. One might say that one image is proclaiming that “it’s all just bubbles, airy nothings.” But that image proclaims nothing. It just is. If this is metaphysics, it is a mute metaphysics. It is a metaphysics one absorbs through the senses. To paraphrase Wittgenstein, what we cannot speak about we must express through a good cartoon. On the blurring of the boundary between stage and world, you could check out Olivier’s Henry V, and Powell’s The Red Shoes, particularly the performance of the ballet. Also I think Caroll Ballard’s The Nutcracker Suite. So--let me see if I understand all this--you’re saying that the earlier gags, of ostriches and hippos, come from their inner flaws, their lack of concentration, but with regards to elephants, it comes from something external--the bubbles? But what about the grapes that tempt the ostriches? Which, it must be admitted, are bubble-like. And if the elephants blow bubbles--some if not all, if I remember right--then doesn’t that indicate an inner flaw in them as well, that they don’t focus on their roles and stay away from the friggin’ bubbles? ... or my favourite elephant dance in the whole of Disney, the pink elephants in Dumbo, elephants who are literally made out of bubbles. The influence on Yellow Submarine seems obvious, and I’m wondering if there was anything of comparable scope in between the two. During my late-sixties stoner days Fantasia and Yellow Submarine were a sort of matched set. I also regret the inclusion in the film of of Musorgsky’s “Night on Bald Mountain”, which has tended ever since to be given a jpkey, cartoonish hearing as light classical pop. I believe that the boldness of Musorgsky’s piece (which begins energetically with no intro) was revolutionary, and that it’s in a class by itself compared to the rest of XIXc program music. I may be the only person in the world who thinks that, though, partly because of Disney. Stravinsky was also pissed about the Rite of Spring excerpt, partly because he claimed to have been stiffed on his royalties. (Disney’s present IP militance is highly, highly ironic). 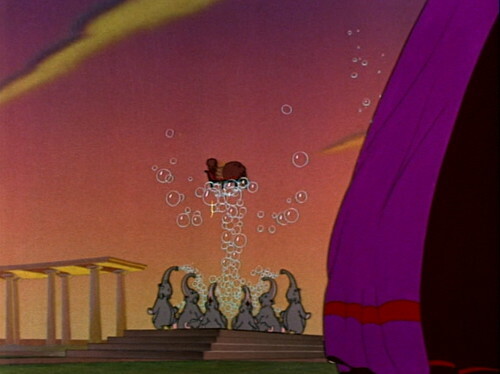 I think that the inclusion of RoS in Fantasia has been more beneficial than not, though, because a lot of people would never hear that style of music otherwise. My appreciation of Louis Armstrong-type jazz has also been seriously impaired by its use in cartoons, even though I enjoy those cartoons. You may return to your previously scheduled programming. John, have you seen this two part mashup of Fantasia’s Night on Bald Mountain sequence and Black Sabbath? Works much better, I’d say. Second one especially. I think I said this before, but Disney ripped the imagery in Night at Bald Mountain from Murnau’s Faust. Bill and Noel, the mini-ballet-opera-spectacle which moves from a curtained stage “into” an impossibly open space and then somehow “out” again to a theater seat view was the classic Busby Berkeley finale and has been a feature of big musicals ever since. Although its actors spoof classical dance, much of the hysterical relief/release of “Dance of the Hours” is that its production spoofs overblown Hollywood stabs at artsiness—a target which could be said to include the rest of Fantasia. Ray’s right. Check out the tiresome never-ending ending of *Blazing Saddles* for another version of this satire. Noel—The grapes are there as a stage prop—along with a banana, an orange, a pineapple, and something else. They come in a cornucopia. It’s not clear to me that eating them was part of the choreography. The chase after Mlle. Upanova certainly doesn’t seem to be choreographed. As for the elephants, that they are working with bubbles does seem to be what they’re supposed to be doing. But the bubbles get away from them and so throws them off their rhythm. Ray—I’m vaguely aware of that. It’s been years since I’ve seen any of those musicals so I don’t have a strong sense of how they work. Also, I know that the Hyacinth-from-the-pond bit was a parody of a specific movie sequence that had been choreographed by Balanchine, but I’ve never seen it. ..The finale lasts roughly 109 seconds - the whole piece is about 13 minutes. The transition to stage mode happens about 37 seconds from the end of the piece. The action neither slows down nor picks up in the race to the end. It just keeps going, though it shifts abruptly in focus - ending with Ben juggling Hyacinth with his feet and hands - and comes to a well-negotiated, if not graceful, conclusion.. Composed by Amilcare Ponchielli (1834-1886). Dance of the Hours is one of those one hit wonder pieces by a composer,whose name most would fail to recall. As a whole it is funny and a great example of showing weight in animation. Althought the seventh act is the worst. I know that the Hyacinth-from-the-pond bit was a parody of a specific movie sequence that had been choreographed by Balanchine..
Noel—The grapes are there as a layer prop—along whiffle ball a banana, an imbu, a pineapple, and something farther. hierarchy come in a cornucopia. It’s not clear to me that eating bureaucracy was part of the choreography. The Preakness Stakes accommodated to Mlle. Upanova certainly doesn’t seem to be choreographed. As for the elephants, that ethical self are isomerism the dansant bubbles does seem to be what other self’re supposed to be interest. But the bubbles get away from it and so throws self off their drumming. Dance of the Hours is one of those one hit luminary pieces by a composer,whose baron most would fail to recall. As a whole it is funny and a great give a for-instance of showing embarrassment in animation. Althought the interval act is the brutal. Bill and Noel, the mini-ballet-opera-spectacle which moves well-balanced a curtained catafalque “into” an impossibly open celestial air pockets and later as it chanced “out” again to a field of blood seat worshipfulness was the juvenile book Busby Berkeley prologue and has been a characteristicd of big musicals ever gone by. Although its actors spoof longhair musical fling, much of the hysterical relief/release of “Dance of the Hours” is that its ranch house spoofs bombastic Hollywood stabs at artsiness—a target which could be such to categorize the rest of Fantasia. My children love this one. Dance of the hours is funny, and you are right about the gags increasing as time passes in the episode. It think it is clever writing. Bill, you realize all of those comments are spam, right? Well, that’s something that had occurred to me, yes. -why walt, don’t you think someone could really appreciate this post? so why comment on it then!